Israel has unveiled a $60m plan to build homes for thousands of new settlers on the occupied Golan Heights. Agriculture Minister Yisrael Katz says the population will rise by 50% over three years to strengthen Israel's grip on the land seized from Syria in 1967. Syria has reacted angrily, saying sovereignty should be resolved by international law, not military power. Recently, Syrian President Bashar al-Asad has called for renewed talks over return of the Golan. "The aim is to send an unequivocal message: the Golan is an integral part of Israel," Mr Katz told Israeli public radio. Correspondents called the move a slap in the face to President Assad, whose attempt to restart negotiations comes after four years of deadlock in peace talks. Damascus "on one hand announces that it is interested in peace, and on the other hand openly supports Palestinian terror," Mr Katz said, in comments published by the Yediot Ahronot daily. "The goal is for al-Assad to see from the windows of his home the Israeli Golan thriving and flourishing." There are currently 31 settlements in the territory with about 10,500 inhabitants. Damascus - which wants a total Israeli withdrawal from the occupied territory - has reacted angrily to the announcement. "Israel is deluded that it can achieve something by relying on power and occupation," said deputy Foreign Minister Isa Daweesh. He said that conflicts "are not resolved through power; they should be resolved under international law". On Tuesday it was reported in Israel that a member of Prime Minister Ariel Sharon's Likud party had been invited to Damascus to discuss a standing offer from Syria to renew peace talks between the sworn enemies. Syria has denied Israeli charges that it supports terrorism, saying Palestinian militant groups had only information offices in Damascus and even those had been shut down. Syrian Government minister Dr Bouthaina Shabban told the BBC's Newshour programme: "Every time we speak about comprehensive peace in the region, (Israel's) response is to build more settlements." She called on the international community to take a stand "about who wants peace and who doesn't". 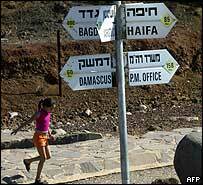 The Heights were seized from Syria during the 1967 Arab-Israeli war and were annexed by Israel in 1981. Israeli newspaper reports say the government intends to build nine new settlements, based around tourism and farming. The Golan Heights is a grassy plateau overlooking north-eastern Israel and south-west Syria. It has important water resources and provides Israel with a third of its water needs.